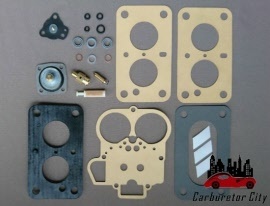 Rebuild kit for the Weber 32 DIR series carburetors as used on the Renault 5 Alpine Turbo. This 75/100 version of the Weber DIR carburettor was chosen by Renault for their Turbo-charged 5 Alpine (which was named 5 Gordini in the UK). It was especially modified for Turbo-use and consequently, this kit contains a number of extra parts to properly services these carburetors.